Camron McGarity kneels on the sideline as the national anthem is played during a charity football game in Chicago on June 2, 2018. Add this to the list of things you cannot do while being black: exercise your First Amendment rights. Oh, wait. The NFL already made that a thing, right? 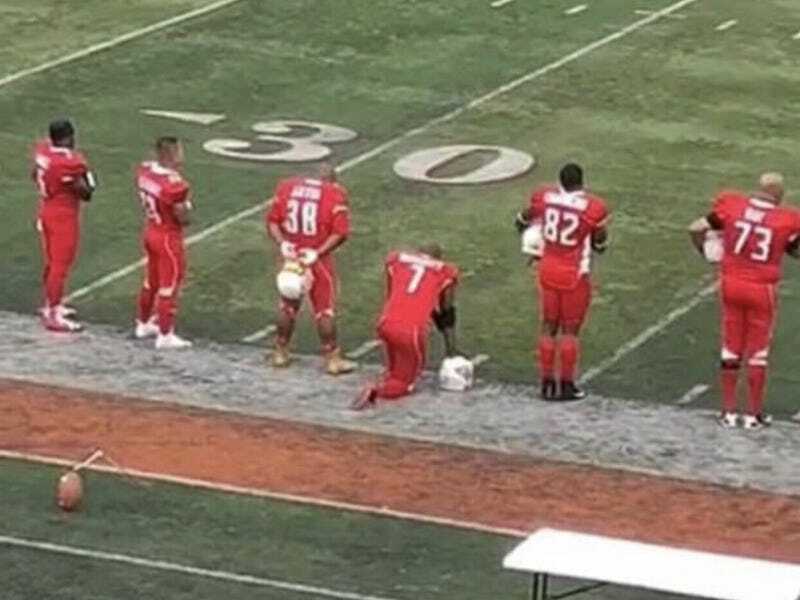 A black firefighter in Chicago is being burned at the stake by his peers and local journalists alike after he made the decision to kneel on the field during the playing of the national anthem prior to a charity football game between the Chicago Fire Department and the Chicago Police Department. Camron McGarity was playing Saturday in the eighth annual “First Responders Bowl,” an event dedicated to the memory of slain 18th District Commander Paul Bauer and former dive team member Juan Bucio, who died during a Memorial Day rescue on the Chicago River, according to the Chicago Sun-Times. McGarity kneeled as “The Star-Spangled Banner” was played before the game. Some of McGarity’s teammates found his protest to be so disrespectful to the families of Bucio and Bauer that they are considering kicking him off the team next season. McGarity will not, however, face punishment from his employer. Chicago Fire Commissioner Jose Santiago, himself a retired Marine, indicated that he had no plan to discipline or reprimand McGarity. And why should he? McGarity was exercising his First Amendment right on his own time. He was not in his city uniform, and he was not acting in his official capacity. Much like the NFL stance on kneeling, this is another example of the attempts to silence black people and derail the real discussion: police brutality and the police killings of unarmed black people. Exactly what are you protesting, seeing that you have what I’ve heard referred as a dream job that is treasured by many and hoped for by many more. Other than afford you the honor and privilege to serve alongside some of the most noble men and women that this city has to offer, how have you been mistreated? Not understanding why the protests are happening and what is being protested are a huge part of the problem. Mislabeling the protests and making them about something they are not is a huge part of the problem. As long as you can obfuscate the real purpose of the protest by talking about how disrespectful it is, we never get to have the real discussion. We never engage in the important discussion. And delaying that delays reform. It prevents change. It keeps things as they are. It villainizes the oppressed while excusing the acts of the oppressor. And that in and of itself is another form of oppression.